Society for the Appreciation of the Lowly Tinned Sardine: Funny. You Like Samurai Swords, I Like Baseball. Funny. You Like Samurai Swords, I Like Baseball. Oldschooly is Living The Dream in Paris. Philippe is off controlling the Mediterranean Riviera and Educating the Masses. A23 is the busiest man in Portland. And The Wife is basking in Barbados. Me? I'm in the middle of a homestand with the night off. This is what dinner looks like. 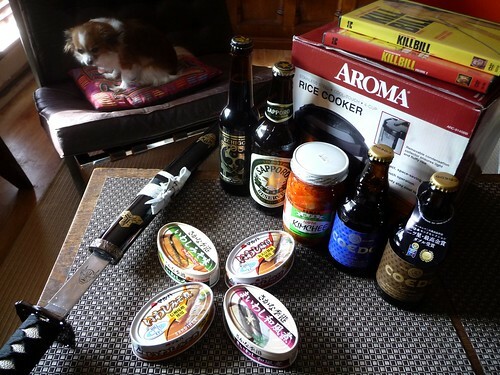 A trip to the Tokyo Fish Market, a new rice cooker, and Kill Bill 1 and 2. I have a selection of Japanese craft beer, some more of that Tazukuri, and for some reason I felt like Kimchee. I bought one larger tin that I'm going to save in hopes that it is Sushi Appropriate. Four tins for tonight. I've got a load of Euro Sardines, and I'm thankful. But we've got Euro Members for that. I'll get to them soon. I have a plan. I am going to Kill Bill. 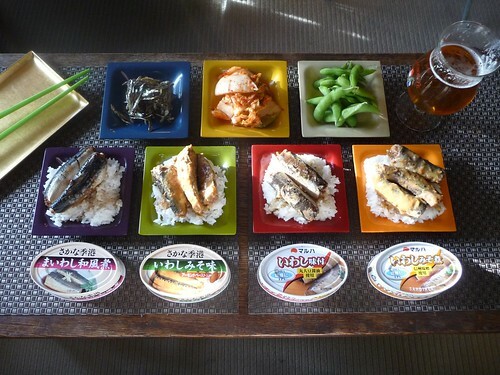 And Japanese Tins with Rice. My rice cooking skills are shite. I bought a cooker. See how that goes. I can't read a thing on these Locally Sourced tins. Two producers. One each of In Soybean Paste and one each of In Soy Sauce. One set is from Mahura Nichiro. 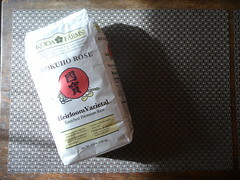 Kokuho Rose Heirloom Varietal Rice. California's oldest family-owned and operated rice farm and mill, established 1928. Oh and first up is the Coedo beers; Ruri (Czech Pils) and Kyara (Vienna Lager). I like beer. 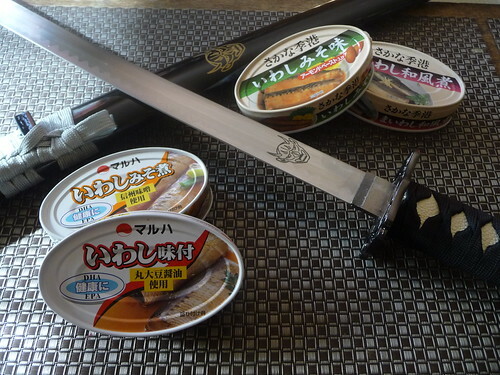 The Japanese tins are soy soy soy. Sauce. Bean Paste. Soy. These are all Gigantor. Poured the sauce over the rice. Starting with the Soy Sauces. Two very big fish. Firm, bit of vertebrae. Reminds me of those Latvians. I like 'em. They aren't epic, but tasty. I do have a sweet tooth. I have had better kimchee. It's a bit mild, but it's working. The soybean paste are different. Three big meaty fish in each tin. They're all right, but not exciting or interesting. 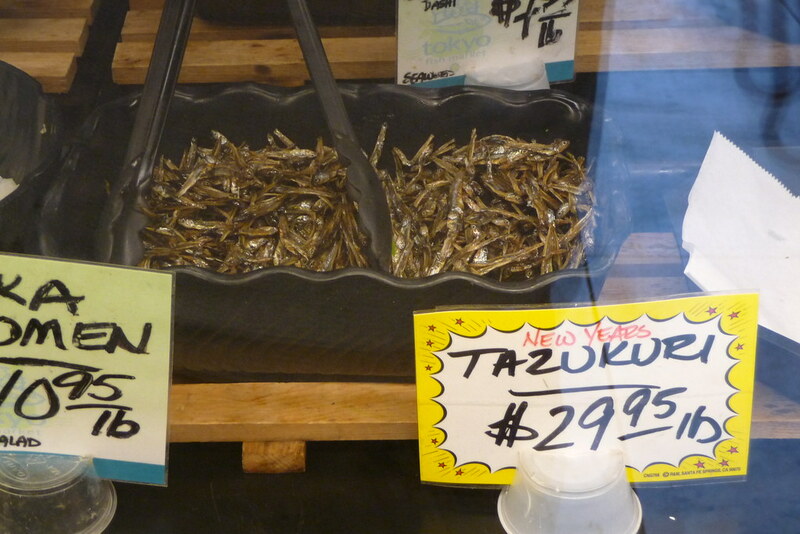 The fish themselves are fine, but the flavor just isn't quite for me. Meh. These tins (from two different companies) could easily have been tinned at the same, uhm, tinnery (ha!). They are very similar. I would recommend soy sauce tins for a nice change up, in a Three Tin kinda way. The soybean paste tins are edible and some folks might dig them. For me, it's Two out of Five Tins. They might make a fine base fish for another recipe, but on there own, well, there are better meals out there. Your presentation is always magnificent. I so appreciate The Society and its Members for sharing. I would like the occasional photo of a bite. All those wonderful items in the pictures but I never get to see how you put them together! Yep. Our Jonny's good with food. The lady who cooks for me has a rice cooker. Elephant Jasmin Rice, or something like that. Good anyway. But your food is prettier. So pretty you need a sword to defend it. Oh hello! Thank you for the welcome:) This is my kind of (not so) secret society, with swords and smelly fish, haha.